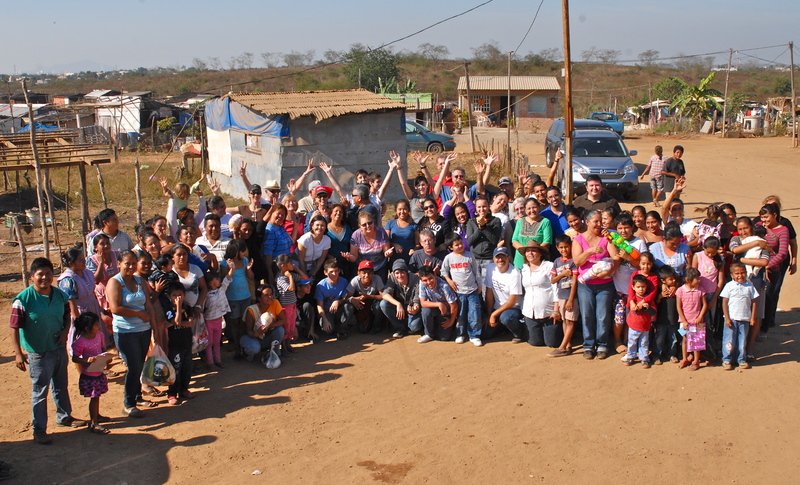 Thank You, Colonia San Antonio & Familia Medina, for Making Our Christmas So Special | ¡VidaMaz! Since 2007 (see photos of 12-year old Danny, above) we have been participating in the Desayuno de los Pollos or “Breakfast of the Chickens.” It has come to define our Christmas each year; a completely, utterly delightful tradition. If you’re a regular reader here, you know that each year over 2000 whole chickens, a week’s worth of kitchen essentials (despensas including beans, flour, coffee, oil…), gently used clothes, new toys and candy are handed out to people who could most use the help in Mazatlán. This year was very special for us for a few reasons. First, I was able to participate in handing out the tickets for the pollos and despensas, prior to the “big day.” This meant that I was able to meet the community leaders as well as at least one representative of many of the families we’d be sharing with, including visiting with them in their homes. It was a WONDERFUL day that I will never, ever forget. Thank you, Yolanda, for including me, and thank you to all the people in San Antonio who so graciously let us into your homes! I was invited to lead a group on the morning of December 24th for the first time. Due to family illness and travel schedules, some of the regular leaders were not able to attend this year. So, I was asked to step in. I learned a lot and loved every second. Thirdly and also incredibly awesomely, we had the good fortune and privilege to be joined by quite a few new friends and blog readers on this terrific day, as well as friends who’ve now made this effort part of their family’s Christmas tradition! Thank you all! Normally we travel out to the edge of town, where there are no paved roads. Until this year, there has been no electricity, no gas, no water. This year, we went to Colonia San Antonio. This neighborhood is only two years old and is already home to 750 families! It is growing so very quickly. And, thanks to the community and to the proactivity of one woman in particular (La Maestra, in slideshow above), this area has electricity, many have propane tanks, and there are several large water tanks or tinacos on site. So, where to start? Photos of the wonderful people with whom we shared Christmas? Photos of their homes, reminding us how lucky most who read this blog are, and our duty to help build a more inclusive, respectful, equitable world? How about photos of the incredible gardens some of the people in this community have planted, to provide themselves sustenance, greenery, and a pleasant pastime? Or, similarly, photos of the crafts I had the pleasure of enjoying, mostly made out of recycled materials? These are items that allow people to connect with their creativity, bring some brightness to their days. To me, the gardens and crafts are signs of the strength of the human spirit. On the day we handed out tickets, I told a lady how gorgeous her bracelet was. Sure enough, the day we handed out chickens, she had made one special for me, God bless her soul. I so appreciate all the people who donate, who show up to load the trucks, Yolanda Medina who started all this, her family and friends who work hard for months (most of the year, actually) to make this all possible. The best part is handing things out, seeing the worry on people’s faces transform into joy, as they receive their chicken, items of clothing, a toy, even a piece of candy. While in 2010 we ran out of chickens and had to go on a shopping spree, this year we actually had a surplus and were able to stop by Ciudad de los Niños on the way home, to share chickens, despensas, clothes, toys and candy with them. If you are in Mazatlán next year, I do hope you’ll join us! While this post is mainly about our efforts on December 24th, there are many ways to help. The primary fundraiser is a breakfast held two to three weeks before—in late November or early December. That event requires help with ticket sales; donations of food, tables, chairs, coffee pots; logistics; set up, waiting tables and clean up; as well as people to collect raffle prizes, silent auction items, and make goods to be sold at the bazaar. 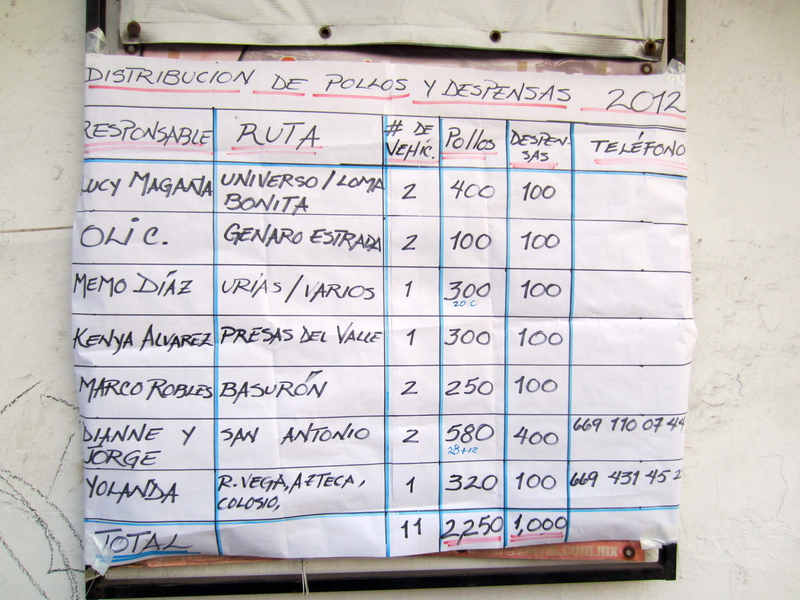 The despensas need to get calculated, funded, ordered and portioned out in the days and week before the 24th. Clothes needs to be collected and sorted along with toys and candy. Any one person can make a huge difference. In 2007 when we started, we came as three people just wanting to do what we could. This year, we brought 17 other people (and TWO much-needed trucks) with us — some newbies, some on their second or third year. All of them will come again and bring some new people with them. Together this can grow and help even more families. Thank you to everyone who helped or joined in this year! ← What Do Mexican Nativity Sets Have That Mine Doesn’t Have? What a heart warming story. Thank you for the photos and being a good American!. Sounds like you must have enjoyed your holiday, Imelda! Esperamos ver te por aquí otra vez pronto! Thank you for reading, for following and commenting! Diane that is wonderful. I read all your posts and even Greg’s when he takes the time. Merry Christmas and Happy New Year! Great to hear from you, C Rams! Even Greg’s???? HIS are the good ones, for sure! We miss you! Hope you had a beautiful Christmas and that 2013 will bring you much health and joy. Pingback: Desayuno de los Pollos/Breakfast of the Chickens | ¡VidaMaz! Pingback: Get Your “Chicken Breakfast” Tickets Now! | ¡VidaMaz!